Amsterdam Schiphol is the city's main airport and one of the busiest airports in the world. It is located around 17km (10.5 miles) southwest from Amsterdam's main train station (“Amsterdam Centraal“). Most of the European budget airlines fly here, so if you're based in Europe you can get some pretty cheap flights to Amsterdam for a city break. The main way to reach Amsterdam centre from the airport is via the Airport Express Bus 397 or the regional train to Amsterdam Centraal. 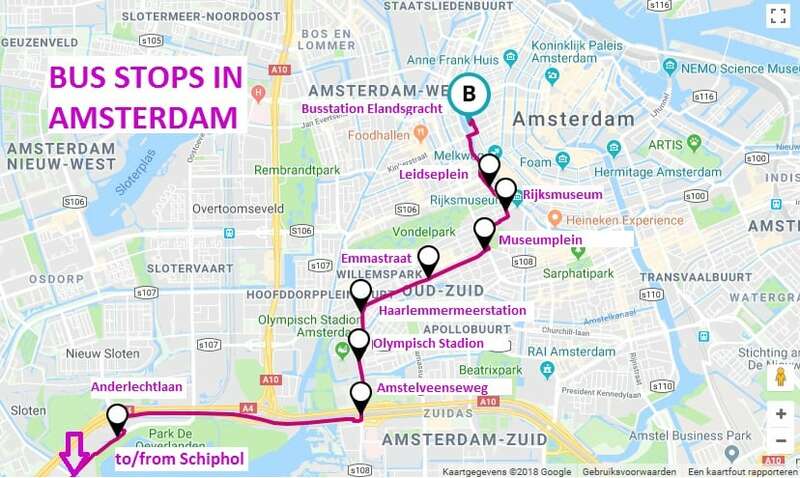 We set out the various options below in detail, but strongly advise you to consider getting an Amsterdam Public Transport Ticket prior to your visit. This card gives you unlimited travel on all the city's public transport networks operated by the Gemeentelijk Vervoerbedrijf (GVB), and also has the option to add on the Airport Express Bus return journey to/from the airport. Amsterdam's public transport is impressive with a comprehensive network of buses, metro, trams and ferries. But this makes the ticketing system rather complicated and confusing, particularly for first time visitors. When buying your ticket at the ticket machines, there are so many options, it can be quite overwhelming! In addition, queues for the machines can get quite long, particularly during rush hour. This not only wastes time, but can be quite stressful. To overcome this, we use the Amsterdam Public Transport Ticket, which gives you unlimited travel across all GVB operated services on the metro, trams, buses and ferries. Needless to say, we found this to be a godsend for our trip. It not only saved us a lot of unnecessary stress and time, but also money. Prices start from €7.50 for a 1 day ticket, plus €10 for the Airport Express Bus return ticket add on. By comparison, a one way ticket on the public transport costs €3, so after 3 journeys alone in one day, you've already paid off the cost of purchasing the Amsterdam Public Transport Ticket. Just remember to add on the €10 Airport Express Bus option at checkout to be sure your pass includes your round trip transfer to/from Schiphol airport. Also, note that this pass does not include travel on regional trains or bus services like Connexxion, EBS and Syntus. Another alternative worth considering is the I Amsterdam City Card. It is more expensive, with prices starting at €60 for a 24 hour card, but along with unlimited travel on the public transport, the I Amsterdam City Card also includes entry to most of the city's attractions, museums, and discounts on other activities. Also note, the Amsterdam public transport is a cashless system. So you need to ensure you have your card before you board. The Amsterdam Airport Express bus (number 397) offers a fast and direct connection to Amsterdam. It runs 24 hours a day and takes you from Amsterdam airport to the city centre in around 30 minutes. The advantage of taking the Express Bus is that you have the option to arrive in various locations in central Amsterdam. The main stops for the city centre are Museumplein, Rijksmuseum and Leidseplein as set out in the map below. Tickets cost €6 one-way, (€10 return) and €1 one-way for children aged 4-11. Note: cash is NOT accepted on board bus #397 so make sure you buy your ticket beforehand! With the Amsterdam Public Transport Ticket, you can add on the cost of your return journey with the Airport Express bus to/from Schiphol, which will also get you unlimited travel in the Amsterdam public transport. The bus terminal is located directly outside the airport on Schiphol Plaza. The regional train runs from Amsterdam Schiphol Airport to Amsterdam Centraal. It takes around 25 minutes depending on the route. Tickets cost €6.30 for a one way journey. The trains run 24 hours a day. From 6am to midnight, there are direct trains several times each hour. During the night from midnight to 6am, train services are more sparse and rarely direct. Check out the train timetable here. Schiphol train station is located directly underneath the airport and is very easy to find when you arrive. Note that the regional train service is not included as part of the Amsterdam Public Transport Ticket. The alternative is to use the Airport Express Bus, which is included. Uber is a very convenient way to get to Amsterdam because payment is all automatically done within the app, so you don't need to worry about having sufficient cash to hand. In addition, you don't need to explain to the driver where you're going as this will have already been set in the app. You can download Uber here and use our invitation code of “sebastienc221ue” to get a free ride. Public taxis are available at Schiphol airport. They normally wait outside the airport by the Schiphol Plaza. However, during rush hour, the queues for taxis can be quite long. To avoid this, we suggest booking a private transfer before arriving. Remember Amsterdam is one of the most bicycle friendly places in the world. So much so that it is very possible to cycle between Amsterdam Airport and the city centre. The airport is located around 17km (10.5 miles) from Amsterdam Centraal station, so should take approximately 1 hour to cycle all the way. The cycle paths from the airport to the city centre are safe, almost entirely flat and very well maintained. If you’re planning to travel extensively around Amsterdam to more remote places in The Netherlands, then it maybe worth considering getting a car rental at Schiphol airport. We recommend Expedia to compare prices because they don’t charge a cancellation fee. Obviously if you’re planning on just staying in Amsterdam, then we advise against this option. This is a city made for cycling with excellent public transport. Driving here is a nightmare and to be avoided in our honest opinion. Even if you're travelling around the country, the train system is both extensive and very affordable. Car sharing is very popular in Europe, particularly in Holland. One of the most popular car sharing services is Car2Go. This is an app which allows you to pick up your vehicle at the airport, then drop it off at one of the specified locations in the city centre. It's very easy to do, and all done within the app. In addition, the Car2Go electric smart cars are environmentally friendly and really easy to park in small spaces. Read more car sharing on the Schiphol Airport website. The majority of the flights arrive during the day. But even if you're arriving on a late flight that is delayed, there are still options for getting from Amsterdam Schiphol Airport to the city centre. The Express Bus runs throughout the night, as well as the regional train. 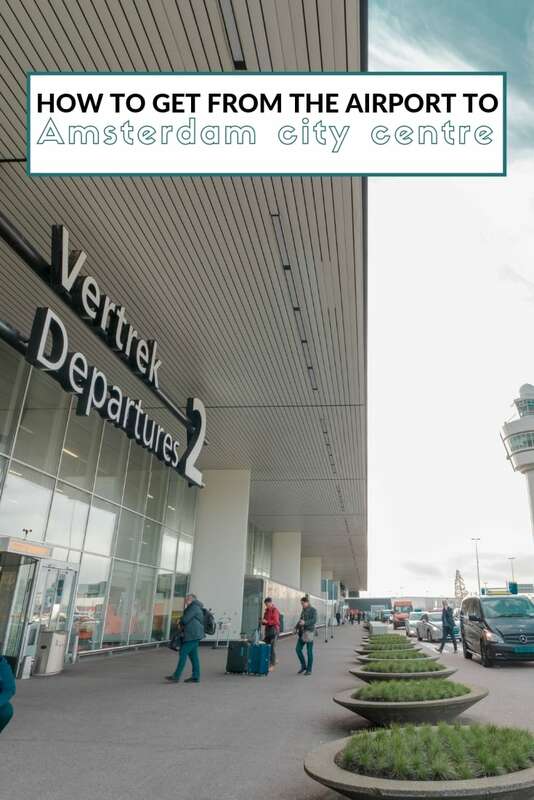 If however you want the peace of mind of knowing your transport from Amsterdam airport to the city centre is sorted, we definitely recommend pre booking a taxi because often with the last budget airline flight of the day, it is usually delayed. As a gay couple travelling, we love visiting Holland because it is one of the most gay friendly and welcoming places in the world. The capital city, Amsterdam, has some of the best parties as well as being rich with plenty of culture and excellent museums, making it ideal for a weekend city getaway as well as a holiday destination. Make sure you read our travel recommendation section below before you go. No-the singles are now 6 € and include 1 connection trip on GVB whithin 90 mins. NOTE: since this year on Dutch buses/trams ONLY payment with cards, NO cash! ATT= Amsterdam travel Ticket, includes GVB AND NS=TRAINS in Amsterdam small region. ARTT= Amsterdam REGION travel Ticket, covers bus/tram/metro of all companies (incl EBS, Connexxion) AND trains in a far wider area around AMS (but not whole country). Full info on gvb.nl – use /en/ and look for tourist-offers. ALL these tix can be bought at S’hol, but NOT from the yellow NS machines-the van from Cnx near stop of 397 should have them, or AKO kiosks. Oh-and this city is now very busy to ban tourists as much as it can, there are simply too many.